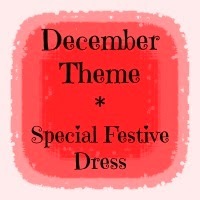 Make a Garment a Month Challenge: December's theme. I know most of us are finishing our November garments - or haven't yet started -or won't be making one at all - but I thought I should get December's theme up early. Most people get busy with Thanksgiving in America, and Christmas elsewhere. So I thought I would give you all advance notice so you could fit this theme into your sewing timeline. Of course, as always, you can always make something else that you want or need to make. I'll be away for a few days soon, so will be updating the November Gallery when I get back. Happy sewing for you too, Sarah Liz! Thank you Sarahliz... Hope you have a nice trip. Have a nice trip. November is/was a bust for me (sewing wise) so hoping that December is more productive. Thanks everyone - and good luck Hana, Accordion, hope you have more luck in December - I should think Uni gets a bit hectic around Nov before the break, so I am not surprised. Too much distraction and energy elsewhere does not for good sewing make. Decisions Decisions! I think I know just what to make! I am in the same boat - I have too many ideas and can't decide what festive dress to make!